Random thoughts, poems, jottings, and as it says, musings. About anything and everything! I could not believe my ears hearing Andrew Lewis on BBC’s Election Time. Apparently he voted for and supported Option B in the last Referendum, because he thought that it had the best chance of getting through the States, as it would have the backing of the Constables if it won in the Referendum. He then went on to say that with Constables and Super-constituencies, the States would then be able to move forward to the next stage of Reform, which would be removing the Constables; which would be his preferred option (and why he is voting No in tomorrow’s Referendum). Most of the people that I have come across who voted for Option A did so because they honestly did not want the Constables to remain in the States. Likewise, I am sure that most of the people voting for Option B genuinely wanted the Constables to remain in the States for a long time. Evidently Andrew Lewis vote was purely strategic – to make common cause with the Constables to get Option B passed, and use the new situation to then expel them from the States. I have rarely come across such a blatant example of duplicity! The Constables, according to this strategy, were apparently a mere tool to get a partial reform, to be tossed aside once their job was done. That kind of strategic thinking does not inspire me with confidence, or trust, in Mr Lewis. H.G. 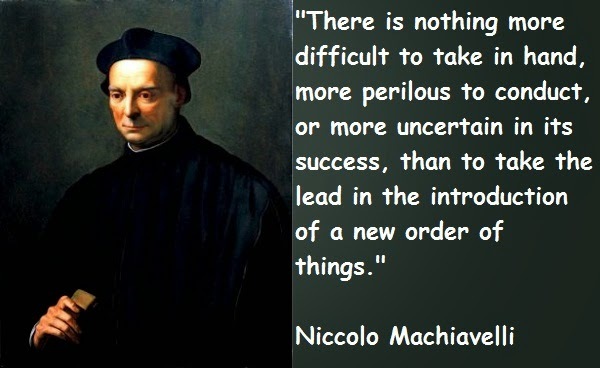 Wells wrote a book called “The New Machiavelli”, subtitled “How to wield power in the Modern World”. Maybe Mr Lewis could write a modern version. Time to throw down the Gauntlet? Selling off the Family Silver? Pig Steals Campers Beer, Gets Drunk & Starts a Fight With a Cow - *A pig yesterday* Outdoor Revival wins our Headline of the Day Award. The judges dedicated today's contest to the late Joe Grundy.